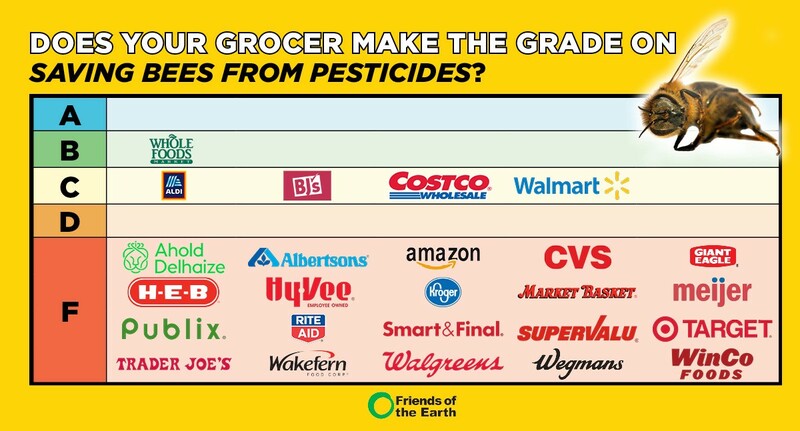 A new scorecard from Friends of the Earth shows that top food retailers are failing to protect bees and people from toxic pesticides. The report, Swarming the Aisles II, shows that, while supermarkets have made commitments on sustainability issues, like energy and recycling, only one, Whole Foods, has taken action to reduce pesticide use in its food supply chain. Along with prioritizing organic products, Whole Foods is working with fruit, veggie and flower growers to reduce pesticide use on non-organic farms, giving the company the highest grade on our scorecard. But the leader is now owned by the laggard. Whole Foods’ new parent company, Amazon [NASDAQ: AMZN], received an “F” for failing to have a pesticide policy or any commitment to increase sales of organic foods. Supermarket Report Card for 2017. This scorecard represents the second year in a row of grading top retailers on these goals. Since 2016, we saw an increase in transparency and additional commitments to expand organic offerings, but no new pesticide policies. Without pollinators, a trip to the grocery store would be a bleak affair. Imagine shelves without tomatoes, strawberries, almonds, and chocolate. Even the meat and dairy shelves would be bare since alfalfa and other feed crops depend on the work of pollinators. Pollinators are responsible for one in three bites of food. Grocery store shelves without bee-killing pesticides versus with bee-killing pesticides. But this is about more than what food is available for us to eat. Bees are the “canaries in the corn fields.” Like the birds that miners carried into coal mines to warn of hazardous gases, the decimation of bee and butterfly populations associated with the rampant use of toxic pesticides warns us that chemical-intensive agriculture is on a fatal track. The environmental and human health cost of pesticide use is “catastrophic” according to a recent UN report that debunks the myth that pesticides are necessary to feed a growing world population. Chemical companies like Monsanto, Bayer, and Dow-Dupont peddle the story that we need to double down on our chemical “war on nature” to feed the world. But if we’re going to feed ourselves now and into the future, we need to protect the clean water, healthy soil, and biodiversity that are the basis of farming. Chemical-intensive agriculture is taking us in the opposite direction and is costing the world $3 trillion annually in environmental damage according to the UN. Farming with nature is the real solution. Forty years of research show that organic farming can yield enough food to feed a growing population while protecting the ecosystems we depend on. Organic farming is a climate solution: it sequesters more carbon in the soil than conventional farming and provides greater resilience during droughts and floods. And organic farms support up to 50 percent more pollinating species than conventional farms, help other beneficial insects flourish, and foster biodiversity. While we push for policies aimed at helping more American farmers transition to organic, recent research shows that most non-organic farmers could dramatically reduce overall pesticide use while growing just as many crops and maintaining, or even increasing, their profit. Organic farms support up to 50 percent more pollinating species than conventional farms, help other beneficial insects flourish, and foster biodiversity. Food retailers have a crucial role to play in bringing about the sustainable food system of the future. 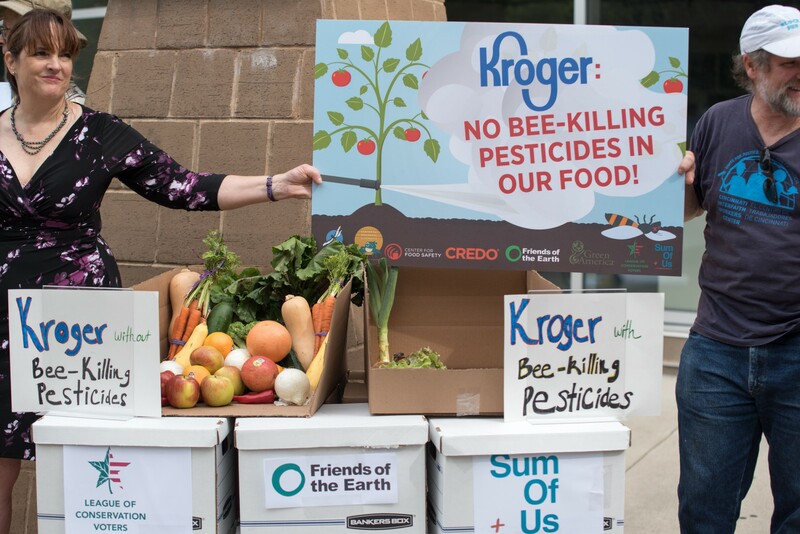 Friends of the Earth, with the support of 50 farmers, beekeepers, and environmental organizations, is calling on food retailers to eliminate pollinator-toxic pesticides in their supply chains and increase USDA certified organic food and beverages to 15 percent of overall offerings by 2025, prioritizing domestic producers. We are also asking retailers to practice greater transparency about sustainable purchasing policies and practices and to advocate for public policies that support a rapid transition to a healthy, sustainable food future. Meanwhile, pesticides like neonicotinoids, chlorpyrifos, and glyphosate are making national news thanks to the federal government’s failure to act on scientific findings that finger these toxic chemicals for imperiling the health of pollinators and people. The growing gap between science and regulatory action makes market leadership on pesticides all the more critical. The story of a pesticide called chlorpyrifos is a case in point. Chlorpyrifos is part of a class of nerve gas poisons developed by Nazi Germany. It is toxic to both pollinators and people. The U.S. Environmental Protection Agency (EPA) was poised to withdraw chlorpyrifos from the market in the face of overwhelming scientific evidence that exposure in the womb and early childhood can derail brain development, leading to developmental delays, lowered IQ, and increased risk of ADHD and autism. But in one of his first moves in office, Trump’s appointee to head the EPA, Scott Pruitt, rejected the science of the agency’s own chemical safety experts and reneged on the chlorpyrifos ban. It’s not hard to follow the money behind this corrupt decision. Dow Chemical, manufacturer of chlorpyrifos, donated $1 million for Trump’s inauguration, the company’s CEO was given a position as head of a White House manufacturing working group, and Dow lawyers sent a letter to the EPA asking the agency to “set aside” the results of government studies on chlorpyrifos. 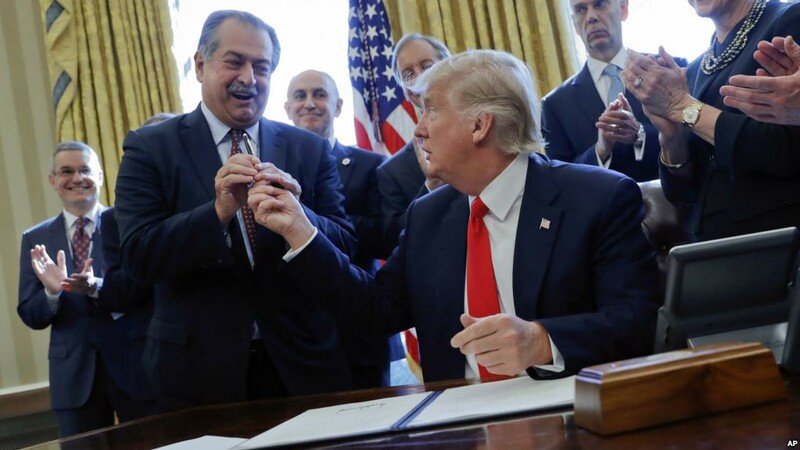 Trump with Dow Chemical’s CEO. Photo via Los Angeles Times. This is not an isolated case. Government regulations often lag far behind the latest science on the harm pesticides cause to human health and the environment. Food retailers need to step into the gap. The health of their consumers and the resilience of their supply chains should be motivation enough. Whole Foods’ Responsibly Grown© program is currently the leading example of a food retailer program that follows the science on pesticides. The program “prohibits specific pesticides that have been identified by scientists as high risk but are commonly used in conventional agriculture today.” Chlorpyrifos is prohibited in all categories of Responsibly Grown© products, along with other commonly used hazardous pesticides like atrazine, 2,4-D, and malathion. Many of the companies profiled in Friends of the Earth’s report are competing to meet consumer demand for organic food, but only six have clearly stated their intent to expand organic offerings in the future: Albertsons, BJ’s Wholesale Club, Costco [NASDAQ: COST], Target [NASDAQ: TGT], Walgreens [NASDAQ: WBA], and Whole Foods. And of those, just four have publicly stated that they are taking measures to expand U.S. production of organic food or support U.S. organic farmers: Whole Foods, Target, Wegmans, and Costco. The top retail news over the past year confirms that organic is the future of food retail, from Amazon’s acquisition of Whole Foods to German grocer ALDI’s bid to open 900 new stores offering low-cost organic food in 2018. Organic food sales increased by 8.4 percent from 2016 to 2017, blowing past the stagnant 0.6 percent growth rate in the overall food market. Sales of organic food are booming in the U.S. because consumers are demanding non-toxic, environmentally-friendly food. But U.S. government programs and policies overwhelmingly support chemical agriculture over organic. Less than one percent of federal agricultural research dollars go to organic farming. The U.S. accounts for 44 percent of global organic sales, but just four percent of global farmland under organic production. In short, U.S. farmers are losing out on the chance to feed Americans’ growing appetite for organic food, and our farms, rivers, and rural communities remain soaked in toxic pesticides. 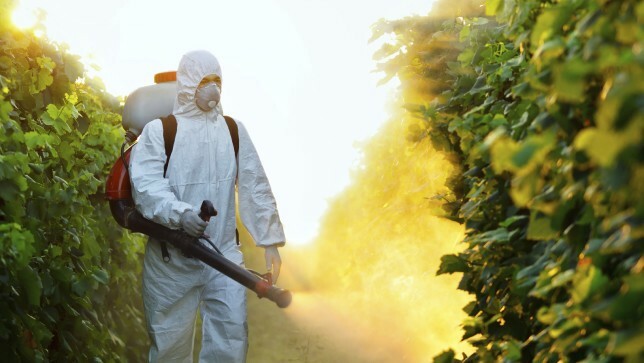 Farmworker spraying pesticides on crops. Image via Sustainable Pulse. It also means that the U.S. is missing out on an important solution to rural poverty. A recent meta-analysis shows that organic farming is more profitable for farmers and provides greater economic stability. And research shows that counties with high levels of organic farming and associated organic businesses are economic hotspots that boost household incomes by over $2,000 and reduce poverty rates by as much as 1.35 percent, even more than major anti-poverty programs. Retailers have an important role to play in expanding organic agriculture in the U.S. by supporting farmers during transition, prioritizing products from domestic organic farmers, and standing up for public policies to advance the American organic sector. This year, the Organic Agriculture Research Act and the Organic Farmer and Consumer Protection Act are just two opportunities to support organic as part of the Farm Bill, the U.S.’s most important food and farming policy. In the hypercompetitive food retail market, strong policies to expand organic offerings and phase out toxic pesticides are critical ways for retailers to distinguish themselves from the pack. Check out Swarming the Aisles II to see how your grocer measures up and for more information on policy opportunities and the science behind pesticides, pollinators, and organic farming.